A combination of ideas initiated after these immediate query & response on Twitter – is it the #hashtag, person or community you are engaged with? 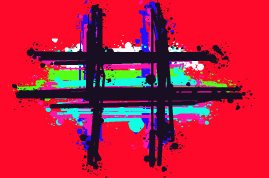 Will your #hashtag live on? 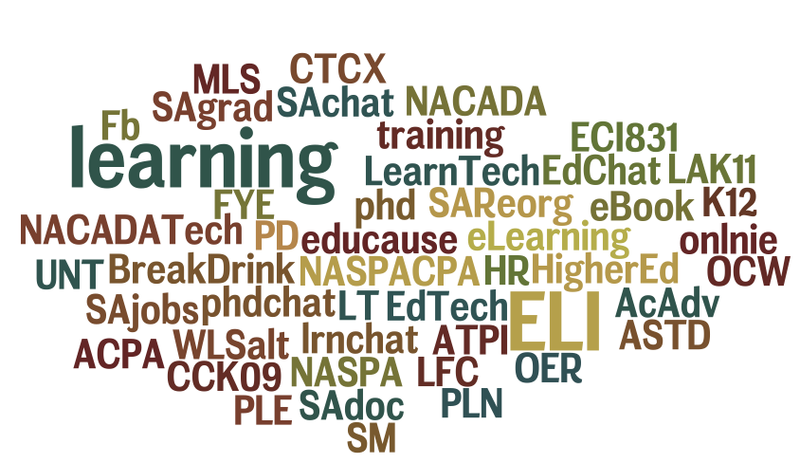 How do you form effective learning networks on Twitter? 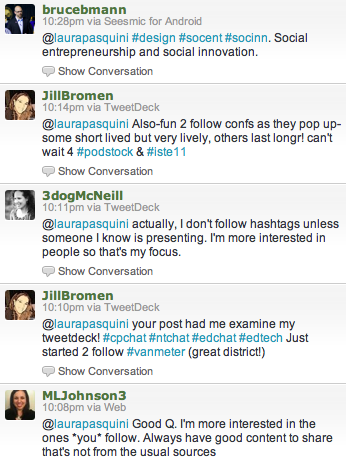 What combination of people & #hashtags will meet the need in ones PLN? These are further investigation areas I will consider to ponder in my research and studies. Your thoughts and ideas are always welcome. Laura, I think you’re on to something and I share some of your thoughts. Personally, I don’t follow *anyone* in Twitter; I only “follow” hashtags. But even outside of my own personal preferences and biases I think there is something powerful going on with some of the hashtags that have grown into communities of their own. That’s one of the things I’m researching and why I’m doing some of the things I’m doing (http://mistakengoal.com/blog/2011/03/18/visualizing-sachat-data-first-draft/ is just the tip of the iceberg). Let me know if you want to chat about this further or collaborate in formally exploring some of these ideas! Hey Kevin – thanks for sharing. This is some very cool research you are doing. Would love to chat further about it after I get back & regroup after the ACPA Convention. Talk soon! What a great post. I’ve never really thought through some of these ideas – PLN or even hashtags that I follow. Thanks for sharing these ideas. I will process through some of this for me.